Use the Sense HAT to create a map of the world around your player in Minecraft: Pi Edition. The Sense HAT has an 8x8 LED matrix. 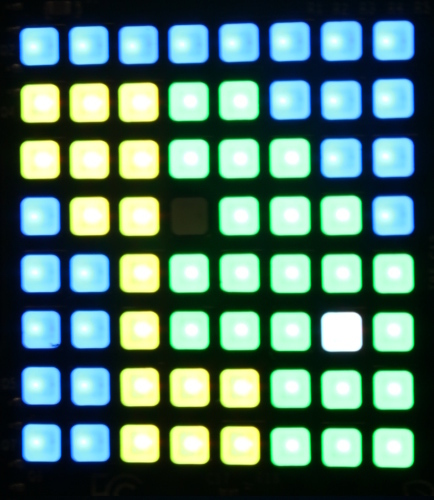 That's 64 full-colour LEDs which you can set to any colour using the Sense HAT Python module, to learn about how colour displays in electronic systems work. 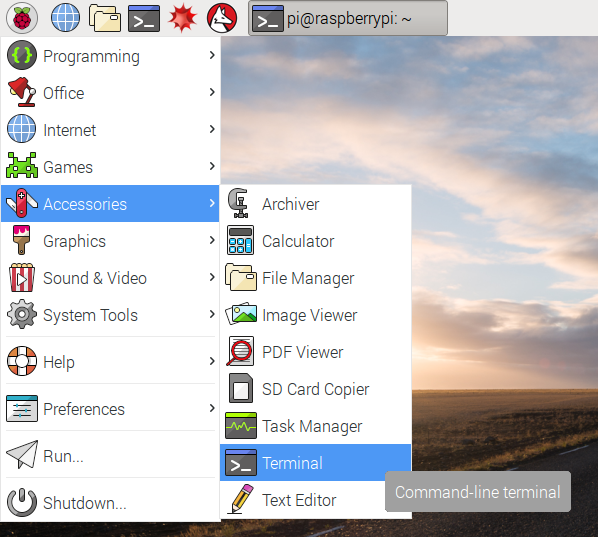 Mount the Sense HAT on your Raspberry Pi and boot up the Pi, referring to the assembly instructions in the Sense HAT guide if neccessary. mkdir means "make directory"; "directory" is another word for a folder. When the Python shell window opens up, click File > New Window to open a new window. This is where you'll enter your code. Save the file as colours.py in your new minecraft-map folder. Save with Ctrl + S and run with F5. Your Sense HAT LEDs should now all be red! from sense_hat import SenseHat: this lets you use the Sense HAT module. sense = SenseHat(): this creates a connection to the Sense HAT hardware, called sense. sense.clear(255, 0, 0): here we call the clear method (function) on the sense object and pass in three colour values, for red, green and blue. How do colour displays work? All colours displayed in electronic systems are made up of a red value, a green value, and a blue value which can be combined to give a wide range of colours, a bit like mixing coloured paints. Colour values go from 0 (none) to 255 (full). Here we used (255, 0, 0), which is full red, no green and no blue. Similarly, (0, 255, 0) is full green and (0, 0, 255) is full blue. Purple is a mix of blue and red, so (255, 0, 255) is purple. What colour does (255, 255, 0) make? If (255, 0, 255) makes purple, what would (100, 0, 255) and (255, 0, 100) look like? What colour does full red, green and blue (255, 255, 255) make? What colour does (0, 0, 0) make? What happens if you call sense.clear() without any colour values? Inside each of the Sense HAT's 64 LEDs are three smaller LEDs: a red, a green, and a blue. All you're doing is setting the brightness of each one and it gives the whole LED a different colour. Now you've had a go at setting the colours of the Sense HAT LED matrix, let's open up Minecraft and have a look around to see what block types you can identify. Click Start Game and then either create a new world or enter an existing world. Press the Tab key to regain access to the mouse cursor and then move the Minecraft window to one side of your screen. Return to the Python windows. Open another new window from the Python shell and save it as minecraft-colours.py in the same project folder. 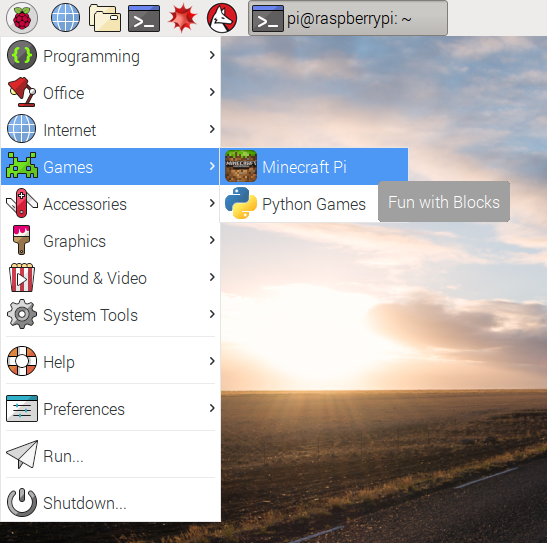 Move this window so that it is on the other side of the screen, and you can see the Python window and the Minecraft window side by side. Save and run your code! You should see the text "Hello Minecraft" appear in the Minecraft window and the Sense HAT should turn green! while True: this is an infinite loop. x, y, z = mc.player.getTilePos(): this gets the coordinates of where your player is standing and sets them to variables x, y and z.
block = mc.getBlock(x, y-1, z): this looks up the ID of the block directly beneath the player (y-1 means one below the player's y coordinate, which is the vertical axis). print(block): this shows us which block ID was returned by getBlock. sleep(0.1): this pauses for a tenth of a second each time the loop runs, so it's not printing out too fast. See which block types you can identify while walking around the Minecraft world. Now you've explored the Minecraft world and seen the different block IDs that are printed out as you walk around, you're going to learn to make the Sense HAT show a different colour depending on what type of block you're standing on in the Minecraft world! You're going need a way to create a mapping from a block ID to a colour; for example, grass should map to green, so block ID 2 should map to the colour code (0, 255, 0). The first line is a comment helping explain what that bit of code is for. 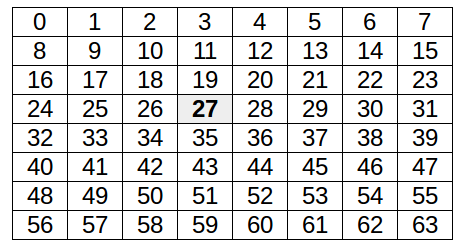 These variables are all integers (whole numbers) because that's what block IDs are represented by. These variables are tuples. A tuple is a data type (like an integer, string, or list) used to store a number of items in a particular order. These could be the x, y and z coordinates or, as in this case, the R, G and B values of a colour. These are 3-tuples because they each contain 3 values. A dictionary is a data type used for storing relations between two objects, like an address book mapping a name to a telephone number. The items in the dictionary are referred to as key-value pairs, so in an address book the name is the "key" and the phone number is the "value". In our case the block type is the "key" and the colour is the "value". Now all that's left to do is to look up the block you're standing on, see which colour it should be, and use sense.clear to change the colour of the Sense HAT display accordingly! To look up a value in a dictionary, you pass in the key. If the dictionary was an address book, you'd pass in the name and be given that person's phone number. So to look up the block type grass you'd use colours or colours[grass] and you'd get back the value for green which is (0, 255, 0). Here we're looking up the ID of the block the player is standing on, as before, and then looking that up in the colours dictionary, then printing out the colour code tuple. Save and run the code, and walk around the Minecraft world. You should see the colour code of the block you're standing on. Walk around to see different colour codes. When you walk on grass you should see (0, 255, 0), when you're on sand you should see (255, 255, 0), and on water, (0, 0, 255). This error is a KeyError, which is a Python exception meaning you tried to look up the value of a key which isn't in the dictionary, like trying to get the telephone number of a name you haven't got recorded. Now it will check to see if the key is in the dictionary before looking up its value. If it's not, it will tell you which block ID it was. Save and run the code, and walk around the Minecraft world and your Sense HAT should show green, blue or yellow when you walk on grass, water and sand. Now add more blocks and colours to your dictionary! Until now, all you've done is set the whole Sense HAT LED display to the same colour. It's possible to set each pixel individually using the Sense Hat module's set_pixel method. Create a new Python file and save it as pixels.py. Save and run the code. It should clear the display and set the top left pixel to white. What happens when you reverse the order of the loops? 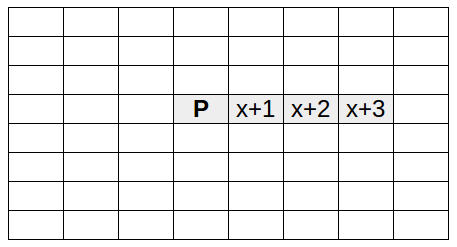 Try for x in range(8) then for y in range(8). What happens if you add a sense.clear() before sense.set_pixel()? What happens if you try range(8, -1, -1)? This should give you a checkerboard of red and blue pixels. Now you have your Sense HAT showing the colour of the block you're standing on, you can use the same logic to show a different colour for each block around you to make a mini map of the Minecraft world on the 8x8 display. In order to make an 8x8 map, you'll need to retrieve the block IDs for all blocks immediately surrounding your player - enough to fill the 8x8 display. The Minecraft API does have an mc.getBlocks() function, but unfortunately it doesn't actually work, so you'll have to write your own function. Create a new Python file and save it as minecraft-map.py. Here you've imported the libraries you'll need, created a connection to the Sense HAT and to the Minecraft world, and created a function called get_blocks which returns an empty list. Now you'll need to implement your get_blocks function. It would be nice to have a generic get_blocks function for any given range of x, y and z returning a cuboid of block IDs but for our purposes this is unnecessary as all we need is an 8x8 grid on the same y-axis. blocks = : creates a new empty list. 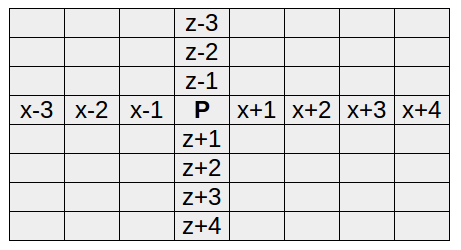 x, y, z = mc.player.getTilePos(): get the player's position. y -= 1: subtract one from the y coordinate to look at the level below the player. for dx in range(x, x+4):: use x values from the player to 3 blocks away from the player. block = mc.getBlock(dx, y, z): look up the block at this location. blocks.append(block): add this block to the list. return blocks: by the time the program gets to this line, this contains 4 blocks as it's been through the loop 4 times. Run the code and you should see a list of four numbers (block IDs), which will be the block you are standing on and the three blocks to the side of you (the direction depends on which way you're facing). for dz in range(z, z+4):: use z values from the player to 3 blocks away from the player (4 rows in total). for dx in range(x, x+4):: use x values from the player to 3 blocks away from the player (4 columns in total). block = mc.getBlock(dx, y, dz): look up the block at this location. return blocks: by the time the program gets to this line, this contains 16 blocks as it's been through each loop 4 times. Run the code and you should see a list of 16 block IDs, starting with the block you're standing on and the 7 to the side of you, followed by each row of 8 blocks away from you. for dz in range(z-3, z+5):: use z values from 3 behind the player up to 5 ahead (8 rows in total). for dx in range(x-3, x+5):: use x values from 3 left of the player over to 5 to the right (8 columns in total). return blocks - by the time the program gets to this line, this contains 64 blocks as it's been through each loop 8 times. Run the code and see it update as you walk around. You will probably find that it's a bit laggy: it takes a small amount of time to retrieve each block ID, and you're trying to do 64 every second. In order to reduce the lag, you'll need to use a technique called caching. This means you record a value the first time you look it up, and refer to the saved value when you need it the next time, rather than look it up again. To do this, you're going to use a dictionary to store the known blocks. That way, you can look up a set of coordinates in the known_blocks dictionary, and only use mc.getBlock() if you need to. This will save lots of time and make your lookup run much faster. Global means you're changing the scope of the variable from being read-only to read/write. b = (dx, y, dz): create a 3-tuple of the current coordinates. if b in known_blocks: check if the block has already been looked up. block = known_blocks[b]: look up the block by its coordinates. known_blocks[b] = block: once a block is looked up for the first time, add it to the known_blocks dictionary. Run the code and walk around. You should see it's a lot quicker at printing the blocks list out. Try reducing the sleep down to 0.1 and see if it can still cope. Now all that's left to do is create the map. You've already learned how to look up a colour from a block ID and set colours to display on the Sense HAT so this should be easy! Here we get the blocks from the get_blocks function which looks them up in the cached known_blocks dictionary or uses mc.getBlock to find them out. Then we try to convert these block IDs into colours, but that's currently a missing piece! This function is a one-liner, but it's quite complex. It uses a concept called list comprehension, which is a way of building up a list in a loop in a concise way. The whole thing is wrapped in square brackets, representing a list, and the definition is to call the lookup_colour function for each block in blocks. The list builds up as it loops over the list of blocks passed in, and is returned as a list of 64 colours. However, we don't have a lookup_colour function yet either! Next you'll need to create a new lookup_colour function that takes a block and returns a colour. You could just use colours[block] but that will fail if you try to look up a colour which you haven't yet set in your directory. Now you have a 64 item pixels list, print it out to see what it looks like. It should contain 64 3-tuples representing different colour values. Add the line player_pos = 27 before your while loop. This should now show a map of a small part of the Minecraft world around you. Walk around and watch it update! 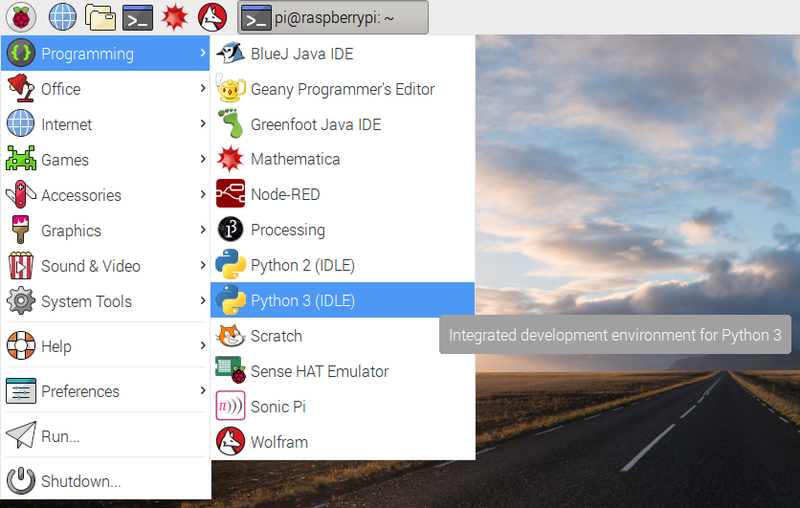 This learning resource is provided for free by the Raspberry Pi Foundation under a Creative Commons licence. Find more at raspberrypi.org/resources and github.com/raspberrypilearning.